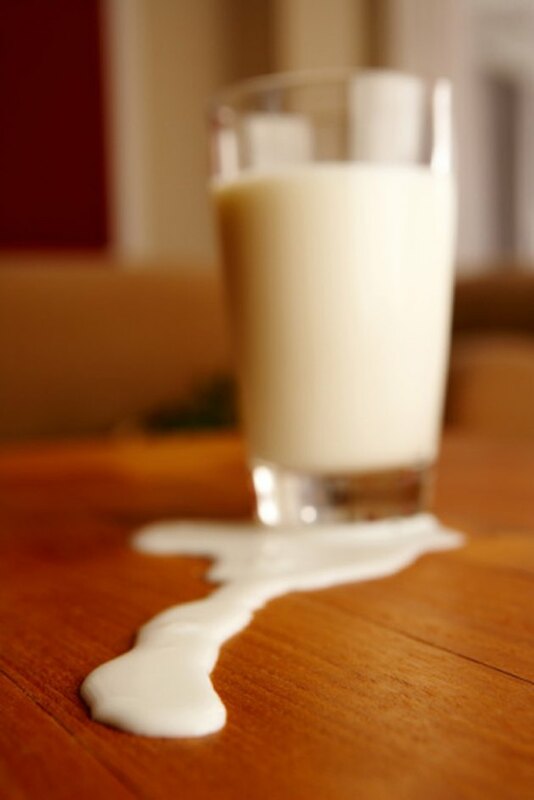 When milk goes bad it begins to curdle and creates an unpleasant sour smell. This odor will attach itself to the container you stored the milk in. The sour milk smell will last for weeks, and multiple washings do little to elevate the stomach-turning aroma. Furthermore, the sour milk odor will affect the taste of other foods or liquids stored in the smelly container. Instead of tossing the container in the trash, use several natural items found in most home pantries to eliminate the smell. Milk is a delicious and nutritious drink. Sour milk is another matter. Mix 1/2 cup of baking soda and two drops of gentle dish soap in a sink filled with warm water. Submerge the smelly containers in the water and soak for 30 minutes to 1 hour. Scrub the containers clean, rinse with cool water and wipe dry with a towel. Fill the sour-smelling containers with equal parts white vinegar and water. Let the vinegar-water mixture remain in the container for several hours. Discard the mixture and wash the container as you normally would. Rinse with water and dry with a towel. Dampen a clean sponge with pure tomato juice. Scrub the stinky container with the tomato juice-saturated sponge for several seconds. Rinse the tomato juice off the container and wash with warm soapy water. Rinse the container clean with water and dry with a towel. Fill the inside of the container with crumbled pieces of newspaper. Secure the lid on the container and let it sit in an out-of-the-way location for 24 hours. The newspaper will absorb the odor. Wash, rinse and dry the container as you normally would.